What should the base setting be of the RP? Setup page for the new "main storyline" of Equestria. So now that we have our "main characters" set up we need to agree on major details that would effect each of our global power. Also... any ideas for a world map? Major Exports: Honey, Cheese, Coal, Gemstones. 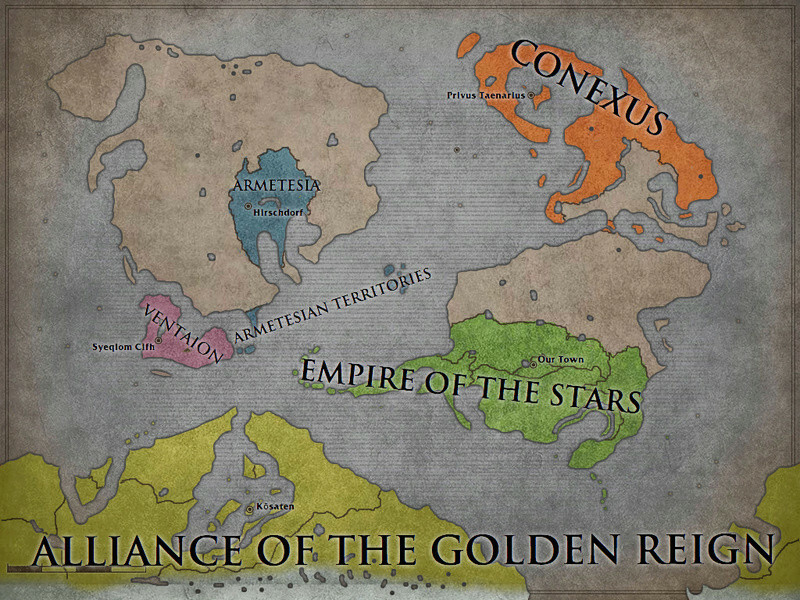 May I have that landmass that is to the bottom left of Armetesia and directly left of the west Armetesia colonies? Edit: Thanks! Its in the exact spot I wanted! I really am looking forward to this Reboot! Biiiig. I like it, though could you move the capital to one of the islands? Eh, so we all seem to have made some progress on our factbooks... and we have the map... shall we start now? Wait what? What's going on? I just assumed things were going to happen randomly like they usually do. I'm fairly certain that most people liked the silliness of the character-focused RPs; RPs on a national scale tend to be more standard and boring. Bah, whatever, I guess I'll app. Major Exports: Transportation (Motor vehicles, aeronautics), Magical Technology. Major Imports: Raw materials, crystals. Intensive citizen loyalty forged by benevolence and inclusiveness. High degrees of magical study attained by majority of population, regardless of race. Bicameral legislature causes consistent governmental indecision, leading to extended law creation. Basically that area divided into maybe 4 or 5 provinces. Imma just quip this quickly. Don't worry, most of the RP will still be character driven, were just trying to cut down on the total character anarchy (it gets old quickly). Putting up parameters of a country's potential constrains one ability for random asspulls that spoil the RP. Actually, thats why I added Population, GDP etc. a nations manpower & wealth can be two major constraints that can limit options so that you will actually have to think about you're next move, for instance, in combat between two countries. Again, to keep this from turning into a godmodding mess like the RP's before. Segway, you good with your position on the map? Putting up parameters of a country's potential constrains one ability for random asspulls that spoil the RP. Have I been doing stuff like that? I don't think I've been doing stuff like that. I mean I do random asspulls with my characters that spoil their personal character arcs (I really need to think before RPing), but I haven't really conducted any business on a national scale afaik. Actually, thats why I added Population, GDP etc. a nations manpower & wealth can be two major constraints that can limit options so that you will actually have to think about you're next move, for instance, in combat between two countries. That sounds a lot like RP on a national scale. Besides, does anyone ever win a war in an RP? Where's the fun in eliminating your enemy? Generally we just have nigh-endless stalemates resolved by the characters. I probably would be, if I could see the map. It's probably just school wifi being dumb. How. How do you do this magic. Clinical depression and too much time on my hands, thats how. » Hello from the Great White North!